Six Corners Association is committed to being a bike friendly shopping district. In 2013, the Six Corners Bike Committee launched a fundraiser to be able to buy four bike corrals that would provide 48 bike parking spots and would be installed on the street. In the course of a month the committee was able to raise over $10,000 for this bike transit initiative. 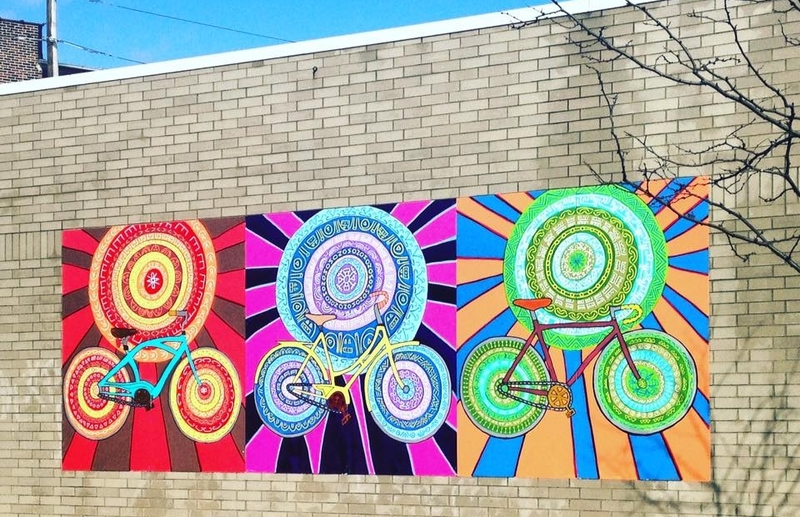 The four bike corrals were installed on April 2, 2016 along with two bike transit inspired murals during the Six Corners Spring Clean Up and Arts Dedication event. In the summer of 2016, Six Corners recieved the fist Divvy Bike Station in the shopping district to provide residents and community members an easy way to get around the shopping district. In the summer of 2017 buffer and shared bike lanes were installed between Addison and Lawrence along Milwaukee Ave. The bike lanes were one of the highly prioritized items on the menu for the 2015 Participatory Budget of the 45th ward. In August of 2017, a Fixit station was installed on Milwaukee Ave. to provide cyclist a station to fix their bike and cycle safely along the shopping district. Promoting special events such as bike-to-work days. Obtaining a bike rack for bike parking in front of their business. Providing a discount to biking customers that display their bike helmet. Got a loose bike seat or need to add air to your bike tires? Six Corners has a Fixit conveniently located on Milwaukee Ave near Cuyler. This Fixit Station has all that you need from tools to adjust any part of your bike to an air pump so that you can ride you bike safely through Six Corners. There are 28 bike racks that hold up to 2 bikes each located in close proximity to Six Corners businesses. Divvy is Chicago's bike share system, with 580 stations and 5,800 bikes across Chicagoland. It’s a fun, affordable and convenient way to get around. Six Corners has a Divvy Bike Station located on Culyer, adjacent to the 4066 N. Milwaukee Ave. building. It's location makes it convenient for you to get to the Irving Park Blue line station, Montrose Blue line Station, or the Mayfair Metra Station. Divvy bikes are also perfect for just cruising around the neighborhood.